CSols AqcTools™ v2.6 allows users to dynamically display Analytical Quality Control (AQC) charts to monitor lab performance, provides paper-free, auditable investigations of control limit failures, includes comprehensive reports and reduces the time to assess and process your QC data. Customers in water, environmental, public health sector and industrial laboratories undertaking chemical, clinical and microbiological analysis will benefit from AqcTools. 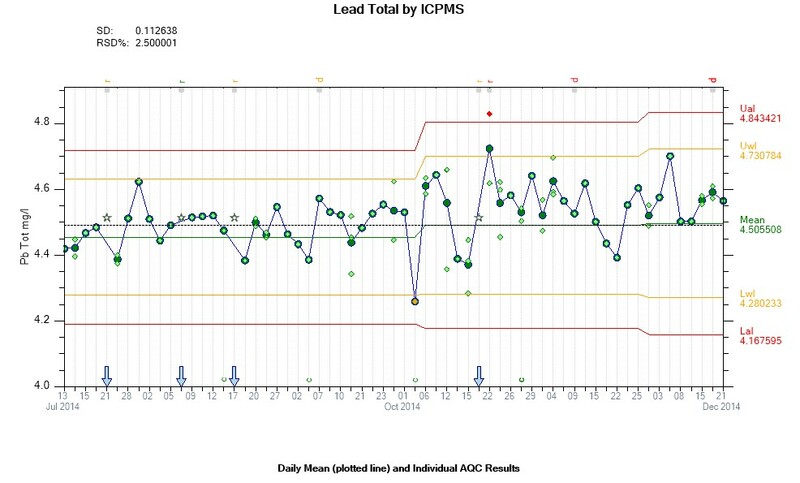 It provides a selection of ‘dynamic, interactive’ charts from the standard ‘individual plotted AQC points’ to charts that can use batch or daily means of data, for both current and historic data. In addition, users can plot charts for an individual analyst to support the labs on-going analyst competency checking. All of the information relating to each individual point such as date, batch number, analyst, instrument etc. is just one mouse click away. Seen in the figure below data points that fail Westgard Limit Rules are colour coded (red – amber – green) to make them easy to identify with quick access to statistics such as mean, standard deviation, bias, % action and % warning failures. This allows users to quickly assess the performance of the analytical method. QC data can be added to AqcTools in a number of ways from simple manual entry or by the use of a configurable template to match an individual labs processes, direct capture from the instruments (via CSols Links for LIMS instrument interfacing and integration product) or directly from your LIMS. 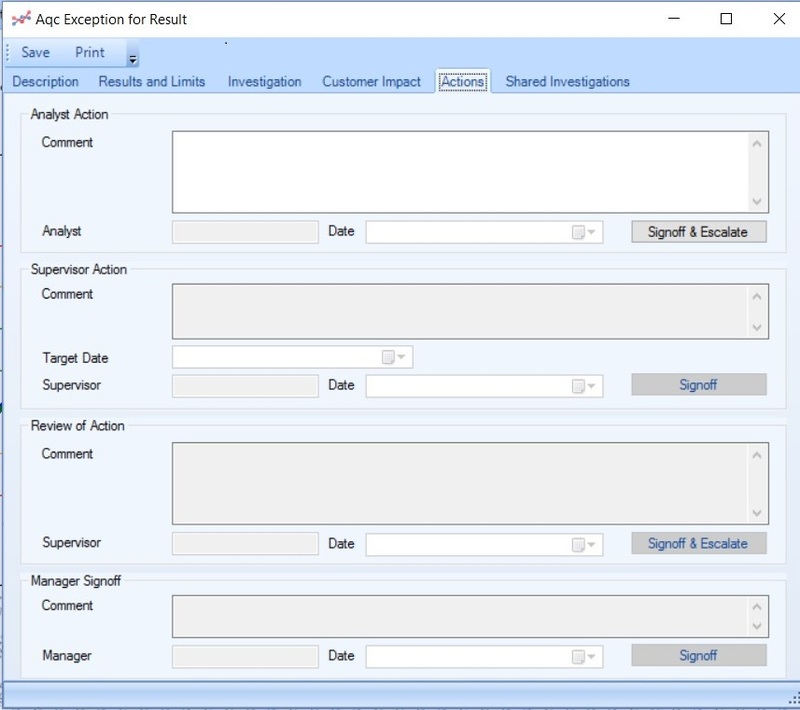 AqcTools provides a paper-free mechanism for recording investigations and the remedial actions taken in the event of Rule failures with an electronic sign-off protocol. Additionally, users can access information directly (‘one-click’) from the chart; which along with the comments functionality allows immediate access to all the actions taken which effect analytical performance. Consequently, all of this remains accessible against ALL historic data and is available for future investigations or any regulatory or customer audits. Furthermore, the Incomplete Exceptions report provides an easy to use tracking system to monitor progress of current investigations. This includes hyperlink access to the charts and each individual investigation report. Also, these features reduce staff time and simplify both internal quality or management reviews. AqcTools provides statistical tests such as F and t-tests required by accreditation bodies for both Limit Review and Chart Review. Consequently, comprised into one easy to interpret report, that uses a colour coded system to highlight any issues. Also, to aid investigations plots and reports are available which indicate whether data is normally distributed. AqcTools provides a convenient, cost effective and dedicated package for Analysts and Managers to monitor their analytical quality and performance. With configurable and automatic trend and Rule failure identification, incorporating paper-free, auditable investigation reports, in-built Limit & Chart Review statistical analysis. AqcTools is the complete AQC package that enables labs to meet Regulatory / UKAS requirements (DWI, MCerts, ISO 17025 & ISO 15189) and act upon any changes in analytical performance that could affect sample result quality – thus resulting in easier, quicker and better quality of reporting of results. To discuss your requirements and obtain further information or ask for a demonstration of AqcTools, please email: labproductivity@csols.com .